I’ve been trying all week to come up with something to blog about, to no avail. I’m not doing anything other than writing and making tea and while my tea is lovely and the writing is going better than I had expected it to, it’s not really anything blog-worthy. Tessa napped in the shape of a comma the other day, but of course she moved before I could get the camera so I couldn’t blog about that, either. So yesterday I tweeted that I should just blog about my shoes, especially since I have new ones, and people (well, Liz & Rachel, who as far as I know do count as people) seemed to think that was a good idea. So this post is all about my shoes. 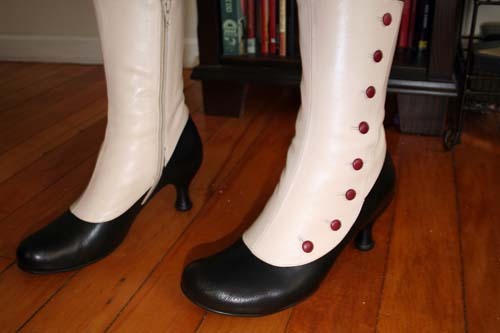 Specifically, all about my Fluevogs. If you have no interest in shoes or photos of shoes, I suggest you stop reading now. Though there is a kitten included in the photos, because I live with needy kittens. Only the shoe people left and maybe some kitten fans? Good. I have a confession to make, first, though. I am not a shoe person. I have never been a shoe person. 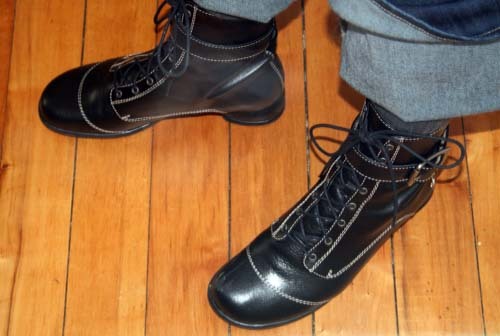 I am thinking about the history of my life in shoes and can come up with nothing more than a few pairs of well-worn Doc Martens and a vague recollection that I had to wear brown shoes with my high school uniform, and I cannot recall what a single pair of those brown shoes looked like. I have never particularly cared much about my footwear. And then a few years ago I started developing a fondness for shoes. Particularly boots, but shoes in general. I have big feet, so I never particularly cared for shoe shopping, and I can’t walk in thin or high heels so that always eliminated most of my choices. But probably due to the wonder of the internet I’ve been able to find more shoes that fit my style and my feet. 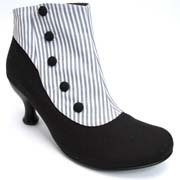 Today I will be featuring my Fluevogs, since I just got a new pair yesterday. But now between gifts and savvy sale shopping I have three pairs and the boy has two. These are the Fellowship Kathy Mary Janes that arrived yesterday. Tessa had to be in the photo because she’s a camerawhore. They’re adorable and don’t seem to need much breaking in other than a teensy bit in the toes. I wanted a shoe that could be dressed up or down that didn’t have much of a heel and these seem like they’ll be perfect. No, I did not pay $239 for them. Google is my friend. I love the Fellowship family, because of the heels. They’re big & low but but nicely streamlined, and the shoes are so fitted that they don’t look clunky. Please excuse my rolled up jeans. I learned today that it is very difficult to take photos of your own shoes. This one was actually accomplished by aiming my camera down into my full length mirror. I flipped it in PhotoShop because the backwards “f” on the heel (that you can’t even see) was making me neurotic. I love these boots. They are comfy and fabulous. I’d thought the buckles would annoy me but they don’t, and even if they did they’re removable. Y’all should know by now that I’m a sucker for Victoriana, and one of my very favorite color schemes is black & white with a touch of red, so the buttons killed me and I kind of had to have these the second I saw them. I left them on after I took these photos, because I don’t have enough opportunities to wear them. The whole Bellevue family is gorgeous, too, and the heel is actually sturdy enough for me to manage, which is brilliant because if these boots hadn’t worked on me I seriously would have cried. I’m kind of going to have to get those, too. I should start saving my pennies now.